The Set-Up takes place in real-time, during a single night at the Paradise City boxing arena. 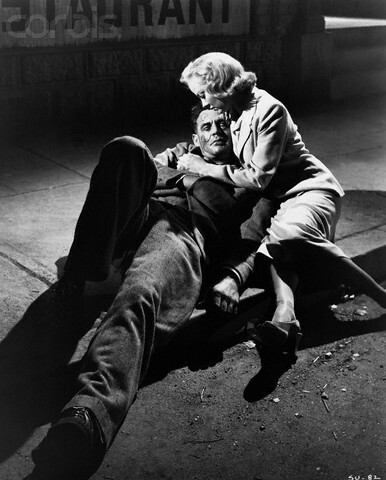 The Set-Up offers a simple story, particularly by the standards of the film noir era, which was known to present plots so complex that you sometimes give up trying to figure out who was done in by whom. This film, conversely, can be summed up in one sentence – it’s about an aging boxer trying to win a fight, against all odds. I believe that it is the simplicity of The Set-Up’s plot that allows the film to illustrate such rich and varied characters. 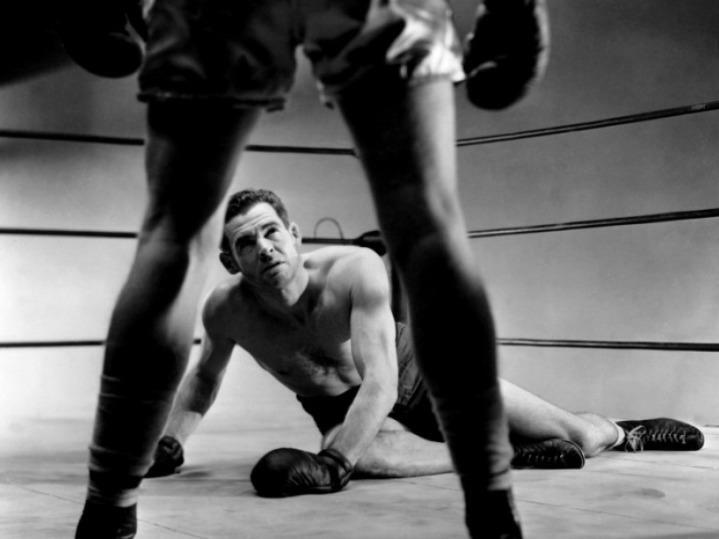 An aging boxer with more losses than wins, Stoker Thompson (Robert Ryan) was nothing if not determined. At the heart of the film are the boxer, Bill “Stoker” Thompson (Ryan) and his wife, Julie (Totter). Stoker is wise and experienced, hardened and cynical – he’s been around the block, he’s seen it all. He’s no champion; perhaps in his heyday, he came close, but now he loses far more bouts than he wins. But on the single night depicted in the film, Stoker is confident that he can emerge the victor. The end of Stoker’s career. The cast is also enhanced by the performances of George Tobias (Tiny) and Percy Helton (Red). Tobias and Helton play Stoker’s manager and trainer, respectively, and sell him out to a local gangster with the odd moniker of Little Boy (Alan Baxter), who shells out a grand total of fifty bucks to guarantee that Stoker will take a fall. Trouble is, Tiny and Red neglect to inform Stoker about this deal until the third round – after it becomes obvious that he is going to win. Refusing to take a dive, Stoker emerges the victor, but in the alley behind the boxing arena, he is beaten by Little Boy’s henchmen, who break his hand, effectively ending his boxing career forever. 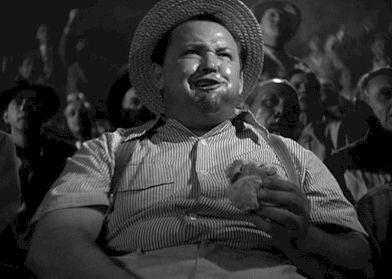 One of the crowd members who added to the richness of the film, this fella was as interested in his hot dog as the boxing match. One of my favorite things about The Set-Up is the small roles, including the depiction of the members of the crowd viewing the fight – there is a blind man who has every move explained to him by his companion; a corpulent fellow who sits eating popcorn and an assortment of other snacks like he’s a kid at the circus; a woman who claims to be squeamish but who watches the matches in a frenzy of excitement and is once heard shrieking, “Quit stalling! Let’s have some action!” Other small, but effective, parts go to the boxers in the other bouts – one is a nervous youngster preparing for his first fight, another is a gentle sort who reads the Bible before entering the ring, and yet another is a punchy old-timer who is knocked unconscious during his unsuccessful bout. Their appearances are brief, but unforgettable, and serve to add to the film’s depth. 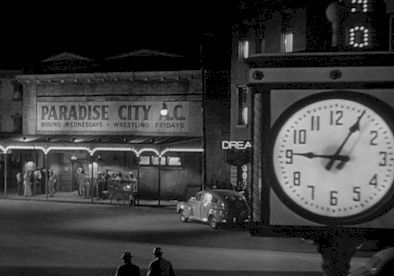 From start to finish, this Robert Wise-directed picture – which is seen in real-time – is riveting. If you haven’t seen it, see it. And if you’ve seen it, see it again. You only owe it to yourself. ~ by shadowsandsatin on September 6, 2011. Yeah, I really like that movie, too. What makes this film extra-special is that it offered a good part for a black actor (James Edwards), which wasn’t quite common in those pre-Sidney-Poitier days. Also, this movie plays in real time and is a perfect example of effective storytelling in less than 75 minutes, something that I often really miss in modern cinema. Again, thaks for the nice artice, Karen. A great noir which thematically hits the mark as well. Always been fascinated by the futility of the protagonist trying to get out from under – and often almost succeeding. Someone who has had all the hard knocks and just wants out. That faint glimmer of hope that is then extinguished. There is a tragic element to it but that’s too simple in the world of noir – because fate is something you cannot gamble with or cheat. Thanks for a great article. (Going to share this!) Regards! Thank you so much for your kind words — and for sharing my post! You are so right about The Set-Up being great. It’s such a simple story, but so well illustrated. It’s absolutely fascinating, not just for the core story about Stoker, but so many other characters as well.